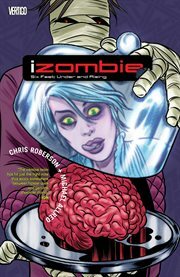 The item Izombie, Volume 3, Six feet under & rising, written by Chris Roberson ; illustrated by Michael Allred, (ebook) represents a specific, individual, material embodiment of a distinct intellectual or artistic creation found in Charlotte Mecklenburg Library. Told from a female zombie's perspective, this smart, witty detective series mixes urban fantasy and romantic dramedy. In this newest collection, Spot tumbles into a cemetery sinkhole full of hungry creatures, Gwen's monster-hunter boyfriend might uncover her big secret, and The Dead Presidents arrive, intent on taking names in a city infested with skeeball fanatics, mad scientists and shambling zombies!